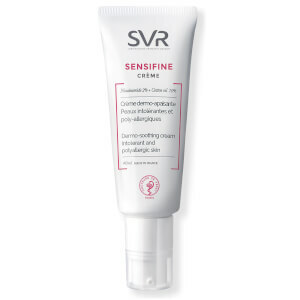 Protect and soothe reactive skin with SVR Sensifine AR Anti-Redness + Rosacea Cream SPF50+, a 2-in-1 sunscreen that provides very high sun protection while relieving signs of redness. Specially formulated for skin prone to redness, sensitivity and rosacea, the broad spectrum sun lotion delivers ultra-high, SPF50+ protection and heat-regulating properties to leave vulnerable skin feeling calm and soothed. Targeting both permanent and temporary redness, including visible fine blood vessels, the moisturising treatment will soothe sensations of overheating while inhibiting further flare-ups. 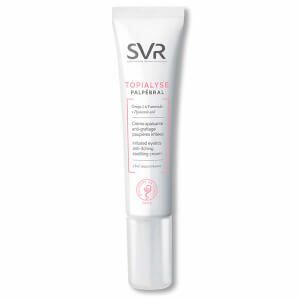 Enriched with Endothelyol® to alleviate redness, and extract of Liquorice to comfort and decongest. Melts quickly into skin without greasiness or stickiness. 100% tested on sensitive skin. Non-comedogenic. Free from fragrance, parabens, alcohol, colourants, mineral oil and preservatives. Before sun exposure, apply evenly to the face. Re-apply frequently. Read the leaflet carefully. Aqua (Purified Water), Diethylamino Hydroxybenzoyl Hexyl Benzoate, Diisopropyl Adipate, Ethylhexyl Methoxycinnamate, Cetearyl Alcohol, Bis-Ethylhexyloxyphenol Methoxyphenyl Triazine, C12-15 Alkyl Benzoate, Ceteareth-20, Methyl Methacrylate Crosspolymer, Glycerin, Ethylhexyl Triazone, Silica, Polymethyl Methacrylate, Dimethicone, Polyester-7, Hydroxyethyl Acrylate/Sodium Acryloyldimethyl Taurate Copolymer, Phenylbenzimidazole Sulfonic Acid, Aminomethyl Propanol, Arginine, Caffeyl Glucoside, Cetearyl Dimethicone Crosspolymer, Dipotassium Glycyrrhizate, Gallyl Glucoside, Rosmarinyl Glucoside, Squalane, Tocopheryl Acetate, 1,2-Hexanediol, Caprylyl Glycol, Citric Acid, Neopentyl Glycol Diheptanoate, Pentylene Glycol, Polysorbate 60, Sodium Laureth Sulfate, Sorbitan Isostearate, Xanthan Gum.